In 25Days, Drew outlines a unique, multifaceted approach that helps you rewrite your neurological patterning—what lies underneath those pesky habits that get in our way over and over again—so that the brain’s neural pathways, biochemistry, and hormones work together effectively, seamlessly, and efficiently. Included in the book are the 25 Days Grading System, Diet, and Workout Plan, as well as tools that will alert and assist readers throughout the book. 25Days is “the ultimate tool for fitness” (Jesse L. Martin, actor) and one of the easiest—and most effective—diets to follow. 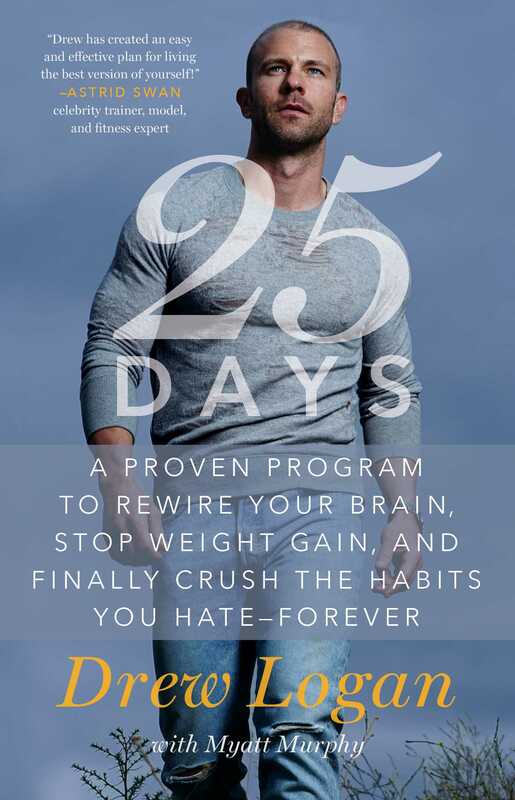 Drew will show you that all you need is to adjust your diet and retrain your brain to be in peak shape and “change your life in ways you never dreamed” (Rick Cosnett, actor). All of my clients always know they’re more than welcome to learn every detail behind why they’re succeeding. But when asked if they want to change first and understand why later—or understand how it all works before they begin their lifelong transformation—well, let’s just say it’s pretty obvious that most (if not all) prefer their results now and the reasons why much later on. Maybe that’s you. And if it is, I get that. And if so, then don’t worry: you’ll be starting sooner than you think. But before you begin 25Days, whether you love or hate details, I need you to know the truth about fitness, what’s been holding you back from reaching your goals, and how you’re going to rewire your brain to finally stop the gain. Here’s the answer: the problem might never have been that you weren’t doing the right things or that you hadn’t done the right things for a long enough period of time. It’s just that you were putting your hopes in something that had an expiration date on it. I’ve never liked the idea of “Lose five pounds in five days!” or “Get skinny for summer!” or any other end goal. In my mind, that’s a very nonsensical way to approach fitness because it teaches you to reach a set objective, whether it’s hitting a certain number on the scale or feeling good about fitting into your summer jeans. And then, once you’ve reached that goal, guess what? You think you’re suddenly fixed. My problem with that cram-and-purge mentality is that it feeds into something we’re taught as early as grade school. When we were young, the game plan was always the same: study everything possible, take a test, get the grade—and then flush out all that information as if it had never existed. It was all about cramming in what you need to know and purging it when it was over. I’m sure if I asked you to memorize all fifty-two words of the preamble to the US Constitution, you could cram it into your brain and recite it verbatim in an hour, but I’ll bet you wouldn’t remember it word for word the next day. Why? Because the cram-and-purge method is only a temporary solution. It’s a neurological strategy used to teach a learned action in response to achieving some sort of goal or deadline. Even when we’re through with school, that cram-and-purge mentality stays with us. Think about it: every business in the world has some daily, weekly, monthly, or yearly goal or deadline that must be reached by a particular time. No matter what you do for a living—whether you’re a CEO or a stay-at-home mom—there’s no escaping the pressure of deadlines and goals. Health, diet, and fitness aren’t any different in how people commonly approach them. For many (and I’ll be willing to bet that’s you), the solution to becoming leaner and healthier has always been to rely on some form of cram-and-purge. And, depending on how well that approach worked for you in the past, it may secretly be behind why you’ve always had difficulty losing weight—no matter how hard you’ve tried. For many, cramming and purging can be a stressful experience, because of the pressure, the fear of failing, or both. It’s a challenge that instantly comes with a negative connotation, which is why many people either avoid most weight loss programs or quit before they see results. For those who manage to stick it out and reach their goals, odds are, that’s it. Because once they reach their target weight, or whatever their goal was, a few days later they find themselves gradually going right back to their old habits. All of the weight lost comes right back—plus a little more. Sadly, everything crammed and purged never turns into a lifestyle; it just becomes discarded until the next bikini season or class reunion. Another major flaw with cram and purge is that you feel successful only at the “end” of the journey—and never during the journey itself. In other words, with most diet plans you always have to wait until it’s over until you’re allowed to feel like a winner. A lot of my female clients tend to be extremely dedicated to the cause. Once they’re ready to lose weight, most will go nauseatingly hard with crazy motivation and focus, which is a wonderful thing. But the problem is that most have only an end result in mind. One of my most successful clients was an amazing woman who was having trouble losing her baby weight. Throughout her early twenties, she had been a runner, played field hockey, and participated in a variety of activities. But in her late twenties, two years after having her first child, she still couldn’t get rid of sixty pounds. When she came to me, she was unhappy because she wasn’t operating at her potential and wasn’t exactly where she wanted to be. All she could focus on was the sixty pounds she needed to lose, instead of celebrating the fact that she did everything right that first day when it came to exercising and eating right. There’s a lot of weight lifted from your mind when you understand that you can be successful day in and day out. When you remove all doubt, it just makes it that much easier to keep doing what you’re doing. I got her to understand that she didn’t need to worry about losing sixty pounds; all she needed to do was succeed today. She had to focus only on the day at hand, knowing that each day was linked to a greater plan. I showed her how to use each day to feel confident that she was always moving steadily in the right direction. Those sixty pounds are long gone now—and have stayed off, by the way—because they stopped being a goal. Instead, they simply became the end result of living and maintaining a healthy 25Days lifestyle. Are you going to make that happen for yourself in twenty-five days? Because most people’s fitness goals aim high, probably not. But you’ll be in much better shape in twenty-five days than you were before. And you’ll be in even better shape twenty-five days after that. More important, you’ll be throwing away the cram-and-purge mind-set that’s always failed you, using a program you’ll never want to discard—and will want to use for life. As a highly educated strength coach, certified fitness trainer, and specialist in performance nutrition, I’m considered an expert in understanding exactly how the body works. But when I began using 25Days myself and with my clients, what I couldn’t comprehend was why it made getting into and staying in great shape so easy to do. Why, even after my clients reached their fitness and weight loss goals, they found it just as effortless as I had to turn the program into a lifestyle. What I’d come to discover is that 25Days had essentially rewired our brains in a way that made it easier to lead and stick with a healthier lifestyle. That realization began after meeting with medical experts to tackle the mild brain trauma that had resulted from my SCAs. As I started working with doctors to pull apart and address what was going on inside my brain, I happened to discuss the program I had designed to keep myself on track—and my doctor smiled. What I quickly came to discover is that my program had indirectly created positive behaviors that had replaced the negative behaviors that had been partially responsible for almost killing me. It comes down to this: even though people love to use the phrase “We are all creatures of habit,” it’s what’s behind our repeated behaviors that’s much more important to understand. We’re all driven by a particular set of neurological patterns—patterns we build over time that imprint onto our brains. Whenever you crave or repeat a behavior, whether it’s something good or bad for you, there’s a neurological pattern causing that action or behavior, whether you’re conscious of it or not. In fact, according to the Society for Personality and Social Psychology,I roughly 40 percent of the activities you do throughout the day are automatic responses you’re often not even aware you’re doing. Think about that: almost half of your day is spent unconsciously repeating the same behaviors over and over again, due to having certain neurological patterns in place. And if those behaviors are negative, you’re spending almost half your day unconsciously doing things that are preventing you from reaching your full potential. How do those neurological patterns get there in the first place? They commonly form around the release of either hormones (signaling molecules produced by the endocrine glands that travel through the bloodstream) or neurotransmitters (chemicals that transmit messages from one brain cell to another). For example, whenever we do something that causes the brain to release any of the so-called happy chemicals—such as endorphins, serotonin, oxytocin, or dopamine, we feel good—but the feeling doesn’t last. Once that rush is over, we want more of it, which is how we start carving out an unhealthy neurological pattern. We may repeat behaviors initially for the hormonal or neurotransmitter response we get from them, but eventually, it’s the repetition that becomes the problem. According to research from University College London,II it can take 15 to 254 days to form a new neurological pattern, with the average being just 66 days. 1. The first step is through disrupting existing behaviors caused by unhealthy neurological patterns to “make space,” if you will, for a new and healthier neurological pattern to form. 2. The second step is through simple repetition: the more consistently you repeat a behavior, the faster you’ll build a neurological pattern around it. 3. The crucial third step is making sure there are cues that help trigger the new neurological pattern. What I found out quickly was that my program was automatically making this three-step process take place. In addition to being an easier method for building lean muscle and boosting metabolism, I had been triggering positive brain chemical responses and preventing negative ones through the right combination of meals, workouts, and rewards. I had essentially created a program that naturally made it easier to stay on track by simply giving the brain enough stimuli and time to form new, healthier neurological patterns—in as little as twenty-five days. I Wendy Wood, “Habits in Everyday Life: How to Form Good Habits and Change Bad Ones” (poster session, American Psychological Association’s 122nd Annual Convention, Washington, DC, August 7, 2014). II Phillippa Lally et al., “How Are Habits Formed: Modelling Habit Formation in the Real World,” European Journal of Social Psychology 40, no. 6 (2010): 998–1009.